Binds to nuclear receptors in responsive tissues (such as female genital organs, breasts, and pituitary gland), enhancing DNA, RNA, and protein synthesis. In androgen-dependent prostate cancer, competes for androgen receptor sites, inhibiting androgen activity. Also decreases pituitary release of follicle-stimulating hormone and luteinizing hormone. Adults: 0.5 to 2 mg (estradiol) P.O. daily continuously or cyclically. Or 1 to 5 mg (cypionate) or 10 to 20 mg (valerate) I.M. monthly. Or 50- or 100-mcg/24-hour transdermal patch applied twice weekly (Alora, Estraderm) or weekly (Climara). Or 25-mcg/24-hour patch applied q 7 days (FemPatch) or 37.5- to 100-mcg transdermal patch applied twice weekly (Vivelle). 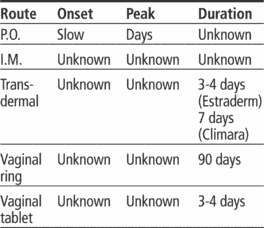 Or 2 to 4 g (0.2 to 0.4 mg) vaginal cream (estradiol) applied daily for 1 to 2 weeks, then decreased to 1 to 2 g/day for 1 to 2 weeks, then a maintenance dose of 1 g one to three times weekly for 3 weeks, then off for 1 week; repeat cycle once vaginal mucosa has been restored. Or 2-mg vaginal ring q 3 months or 10-mcg vaginal tablet once daily for 2 weeks, then twice weekly. • Inject I.M. dose deep into large muscle mass; rotate injection sites. • If switching from oral to transdermal estrogen, apply patch 1 week after withdrawal of oral therapy. ☞ Monitor vital signs and cardiovascular status, especially for hypertension, thromboembolism, and MI. • Be aware that a few cases of ring adherence to the vaginal wall have occurred, which may require evaluation of wall ulceration and erosion. • In diabetic patient, monitor blood glucose level and watch for signs and symptoms of hyperglycemia. • Instruct patient to place transdermal patch on clean, dry skin area. • Teach proper technique for use of vaginal tablet, ring, or cream, as appropriate. • Tell patient drug may cause loss of libido (in women) or erectile dysfunction (in men). Encourage patient to discuss these issues with prescriber. ☞ Teach patient to recognize and immediately report signs and symptoms of thromboembolism. • Advise patient that drug may worsen nearsightedness or astigmatism and make contact lenses uncomfortable.